Have you made Canned Blackberries? 1. Blackberries must be handled as little as possible so be careful in initial picking not to include leaves or stems. 2. Best picked just after a rain. Rinse berries briefly in strainer under running cold water. 3. Place in large canning vessel; add honey for sweetness if desires. 4. Add apples for pectin. Bring to boil; reduce heat and simmer 20 minutes. 5. (Berries will have a 'thick soup' consistency being 3/4 berries and 1/4 juice, if not stirred too much). 6. Spoon into hot, sterile jars and cap immediately and set aside out of draft. 7. Wait for lids to pop sealed (those which do not seal can be reprocessed). 8. Use as syrup, as spread for bread or eaten straight from jar as a snack. 9. 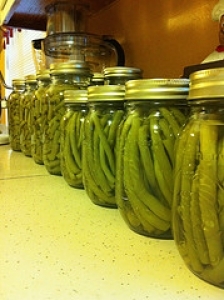 NOTE: Get a book on canning if unsure about sealing and processing.